So go ahead lil’ pups, shed all you want, the Scotch-Brite lint roller is here to save the day. Our dogs are #worththemess! 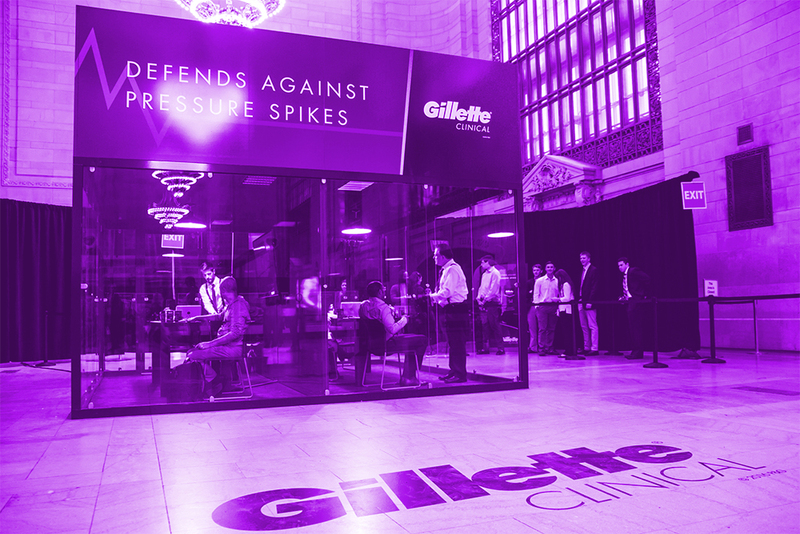 To demonstrate the power of Gillette’s Clinical Clear Gel Deodorant, we unveiled the Gillette Pressure Chamber in the heart of Grand Central’s Vanderbilt Hall. Commuters, tourists and local New Yorkers alike had the unique opportunity to participate in an on-the-spot polygraph test administered by renowned polygraph expert Daniel Ribacoff. When the pressure spikes, Gillette Clinical Clear Gel keeps you cool and fresh. Not only did participants receive product samples, but NBA star Carmelo Anthony stopped to interact and moderate polygraph sessions, adding to the already intense experience! Four lucky Wyndham franchisees from a digital sweepstakes were flown to NYC for the chance to win one million dollars. We designed a massive gameshow experience and placed it in Times Square, where participants had a once in a lifetime chance by picking the winning suitcase on the wall. Hosted by the one and only Tony Danza! The gameshow inspired space then opened up to the public, giving away prizes and free hotel stays to New Yorkers and tourists alike. 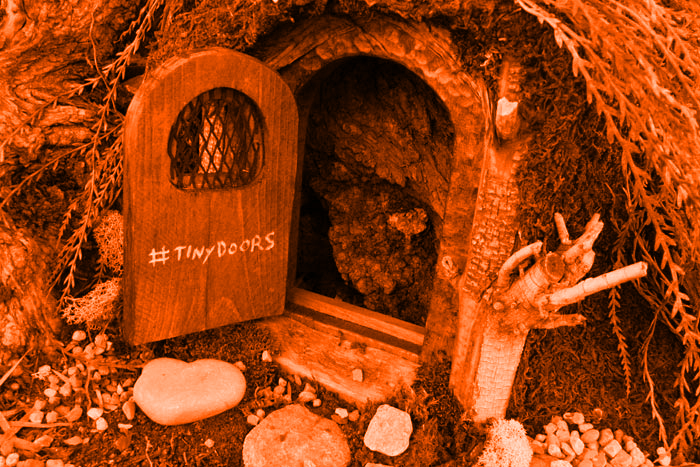 Keebler aimed to bring charm and joy to cities all around the U.S with their “Tiny Doors” project. We helped source trees with openings shaped for elf sized doors and invited artists to create whimsical designs for each location. This became an exciting scavenger hunt for consumers to search their city in the hopes of finding one of these Tiny Doors! To celebrate the launch of the Mini Coupe, we placed a massive 40’ rocket ship in NYC, with an actual vehicle attached to it. The Mini Coupe team, donned in authentic NASA suits, handed out freeze dried ice cream as New Yorkers took in the installation. 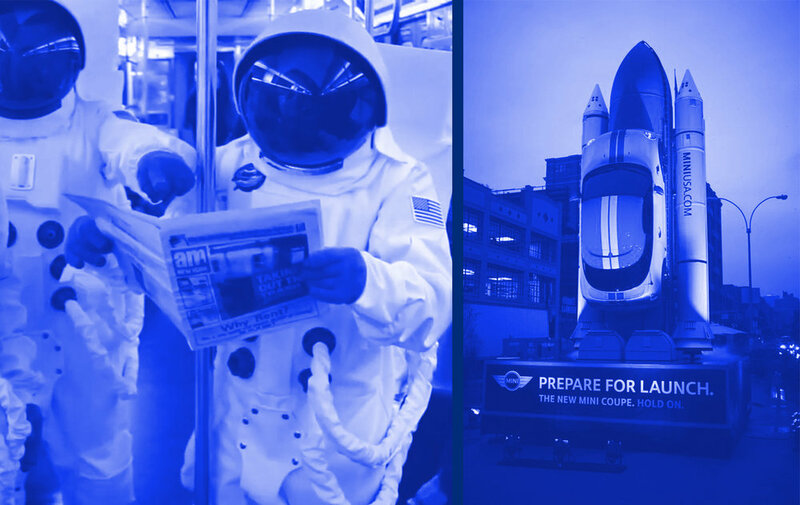 Then, to increase reach, we partnered with the Halloween Parade and NY1, placing 4 Mini Coopers and astronauts in the parade route. Liftoff! To launch Kellogg’s Crunchy Nut Cereal, we fabricated the world’s largest cuckoo clock and placed it on Hollywood Boulevard. Bringing their campaign “It’s Morning Somewhere” to life, every hour on the hour, for 24 hours, one comedian emerged as a character from a place in the world where it was currently morning. Hosted by Nick Cannon, the activation included 24 unique comic performances, 24 hour sampling and a live-feed of the cuckoo action to extend our reach globally. MINI wanted to shake things up when introducing their first four door MINI Countryman. With winter being the season of launch it was the perfect time to create a giant MINI Snow Globe and literally “Shake Things Up”. This became an eye-catching photo moment in both NYC and LA as on lookers snapped photos of the whimsical display while holiday shopping. Our first nationwide mobile tour! Oh the memories. 7 Interactive Trucks, 12 Markets, 1,600 brand ambassadors. The Cricket Wireless Mobile Tour traveled the country educating consumers on their expanded coast-to-coast coverage. Blending interactive technology with mobile vehicles, consumers tested their geography skills with the Man vs Map challenge. We also dabbled in digital storefronts and projections throughout the tour.